But the DART project -- a joint effort between NASA and the John Hopkins Applied Physics Laboratory in Maryland -- is for the asteroids that are too big to break up -- those that could have severe consequences for the Earth if they hit. "DART would be NASA's first mission to demonstrate what's known as the kinetic impactor technique -- striking the asteroid to shift its orbit -- to defend against a potential future asteroid impact," said Lindley Johnson, NASA's planetary defense officer in Washington, in the press release. "This approval step advances the project toward an historic test with a non-threatening small asteroid." The target of the test is an asteroid system called Didymos, the release said. Didymos -- Greek for "twin" -- is a binary asteroid system, made up of one asteroid, Didymos A, and a smaller one, Didymos B, which orbits its larger neighbor. "The kinetic impact technique works by changing the speed of a threatening asteroid by a small fraction of its total velocity," the release says, "but by doing it well before the predicted impact so that this small nudge will add up over time to a big shift of the asteroid's path away from Earth." Back home, scientists will study the impact and the effect is has on Didymos B's orbit around Didymos A, to determine whether this technique is a feasible method for saving the planet from asteroids that could otherwise have devastating impacts. "DART is a critical step in demonstrating we can protect our planet from a future asteroid impact," said Andy Cheng, one of the leaders of the Johns Hopkins team. 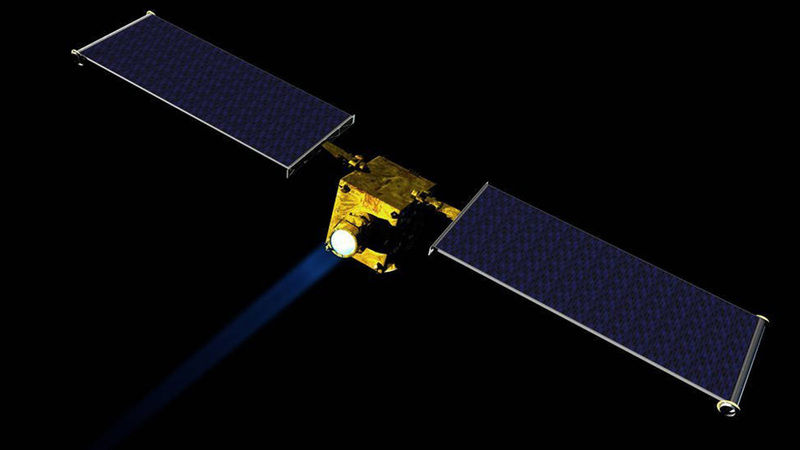 "With DART, we can show how to protect Earth from an asteroid strike with a kinetic impactor by knocking the hazardous object into a different flight path that would not threaten the planet." The announcement coincided with International Asteroid Day, which commemorates the largest recorded asteroid impact in Earth's history, when in 1908 a meteorite hit Russia's Podkamennaya Tunguska River in a remote forest, leveling trees and knocking over people in a town 40 miles away.